Sweet sweet summer, you may not be shining today but you are waiting in the wings ... longer lighter nights, barbecues, picnics, holidays, summer festivals and Pimms await. Oh how I love the energy and excitement of this time of year. 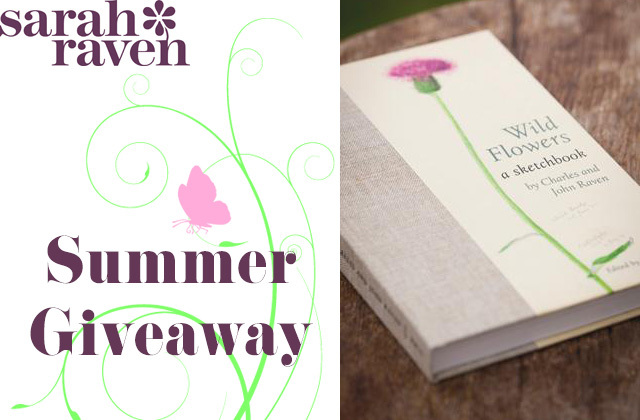 In celebration of summer's arrival in the UK and as a general cheer-up, I'm so pleased to announce a giveaway. Sarah Raven's team have given me the honour of hosting this giveaway. If you're not aware of Sarah's website and blog please check them out. Sarah's knowledge and writing of flowers and gardening is simply inspirational. I have chosen the book Wild Flowers: A Sketchbook as my prize. Written by Sarah's father and grandfather it tells the story of how, in 1930, they set out and succeeded to paint and write about the entire British flora. I love the family history behind this book and I'm sure it'll be a book to cherish for the lucky winner. To be in with a chance of winning please make sure you're a follower of Justalittleless and if you could tell me what your simple summer pleasure is that would be wonderful! Alas, this book is heavy and so this giveaway is limited to UK readers only. The winner will be announced on Tuesday 2nd July. I will be running a worldwide giveaway soon, so please bear with me if you live outside the UK. Oh... my simple summer pleasure... walking barefoot on grass or sand. What a beautiful book. My simple summer pleasure is reading a good book in the sunshine. Or just watching children playing. When summer's here simple pleasures are more than enough. Thank you for the giveaway, and well done on your 1,000 posts. My simple summer pleasure, is sitting under the parasol on the patio with my feet up and a good book or foodie magazine, with a glass of Pimms to hand and a large homemade shortbread biscuit. With the dogs snoozing at my feet and the cats basking in the sunshine an hours relaxation brings peace to the soul and harmony to an otherwise busy day. A simple summer pleasure....it is early evening, about seven pm. I have put Olly to bed. I sit down with a cup of tea for a little quiet time. I breathe in and out. I listen to the sounds around me - insects, birdsong, the passing traffic and voices from the street. I reflect on the day, and plan tomorrow's. The bees buzzing in the cotoneaster, the sun on my face, a good book, crab sandwiches and my loved ones around me! Thank you for a lovely giveaway, my summer pleasure would be to sit in the garden, reading or knitting. Sarah Raven is such an interesting writer. What a lovely giveaway. My simple pleasure is to walk slowly through the garden just enjoying the scents of Lavender, lilies, carnations...and also tomatoes! My simple summer pleasure is watching the sun go down and my favourite places to do this is either in my garden or beside the sea. What a lovely giveaway. Nothing lovelier than wild flowers. My simple summer pleasure is a picnic by a riverbank. Heaven.. Simple summer pleasure - how difficult to choose just one but I think I'd pick sitting on my favourite garden bench with homemade cushions by my side, a bowl of granola, fresh fruit and a good cup of coffee. Watching the birds, flowers and trees is just the icing on the cake. What a delightful giveaway :). My simple summer pleasure is eating homegrown salad. Hello! I've just found you via Garlic and Sapphire - I'm going to enjoy reading back through your blog with a cup of coffee and piece of freshly made Strawberry & Vanilla Marscapone Cake by my side. This is a great giveaway, I do love wildflowers. As a person who strives to enjoy all life's simple moments, I have many many summer pleasures to choose from: listening to jazz at the Heath bandstand on a Sunday afternoon, drinking Pimm's with friends, visiting gardens, watching bees around my cerinthe or comfrey plants ... one of my favourites, though, is collecting fresh food and salads from my veg patch ready for the next meal - freshly picked summer salads are great! My simple summer pleasure is walking my spaniels through long grass first thing in the morning, listening to the birds singing, or watching horses play in a field maybe, or eating strawberries straight out the garden when they've been warmed by the sun, but no, actually it's spending time with the people who matter most, my lovely hubby, son and daughter in law!! I spent today photographing wildflowers when I was out walking the spaniels so winning this would be fabulous as it would mean I could identify all the flowers I took pictures of!! My simple summer pleasure is sitting on the bench at my allotment after gathering some beans and tomatoes for tea and a posy of flowers for a jam jar.